….Is this Bergen? The weather has been quite seductive, no? So, May 18th your #NetNarr final exam becomes accessible via Inspera. You have until May 26th to submit your work. I hope that the process of preparing the exam will be synthetic, and help you realize all you have learned with this course. Also, I just wanted to make sure to share here the slides from my last lecture. It has been my sincere pleasure to work with all of you this semester. Now that we have built a learning community and network together, please don’t be shy in the future regarding our shared interests and your future work. You know how to find me ;). And I am happy to be in touch with each of you. Our introduction to Electronic Literature! This past week has been an effective overview of Electronic Literature. I have introduced all of you to the Electronic Literature Collection – (Volumes One, Two, & Three). In addition, I introduced to the important #elit resource known as ELMCIP (Electronic Literature as a Model of Creativity and Innovation in Practice) – this is a great forum to search and discover critical material on particular #elit texts, the community of #elit practice, etc. We spent the majority of last week covering an introductory glimpse of the various genres of Electronic Literature. We surfed the ELC to discover a variety of examples of each of these genres. My lectures are a good reference for that overview of the field, and I hope you now have a sense of the different kind of literary texts to discover within the broader “umbrella” of Electronic Literature. Here are my slides for 10/4/18 & also 12/4/18 for your further reference. As you all know, I will be traveling for the next few weeks of April (in the UK & Ireland for several talks on -electronic literature, -networked learning and -networked pedagogy, and also -#Netnarr as a case study. Due to my lecture tour, I would like you all to spend the next few weeks spending solid time (at least 3 hours) surfing and exploring the ELC collections further. Please take the time to discover new literary forms, and find a few pieces that “speak to you”, that draw you in, that capture your attention and make you think about what literature is, and what literature is becoming. In addition, you should also check out the Studio Visit I post here on our course website, and take the time to tinker with new tools in order to develop an elit piece of you own (I would like each of you to have your own #elit “making” or composing experience). In addition, I suggest you consider connecting with the #NetNarr “pop-up twine group” for peer learning support. Check our hashtag for further announcements. You are almost there in completing your comprehensive blog portfolio for #NetNarr! Explore the ELC volumes to discover a piece that is meaningful to you personally, and write critically about how that piece of elit makes its meaning. In other words, write a close reading of that e-literary text. How do you read this text, and how do you navigate this text? How does the text position you as a digital reader? What multimodal elements are incorporated into the elite text (sound, image, kinetic text, video, links, AI, animation, etc.). What symbolic language is employed in the text you selected? How is interactivity experience in this choice of elit? Please choose a piece of elit that you are inherently drawn to, and write a critical review of how it works, and what kind of meaning you take from it. You could try to your hand at a piece of generative fiction by creating your own twitter bot. Breath life into the machine. Animate a unique voice. Instructions on how to create a twitter bot are here and here. Or you could try your hand at a hypertext story. There are so many tools that would facilitate building a hyperlinked story world. You could use something as simple as google docs and/or google slides. There is also the very user-friendly (free) inklewriter application which I think you will find is a fun forum to tinker in. And finally, we you could try to build a choose your own adventure style game/story with Twine. (Remember, we have a #NetNarr peer-lead twine community to help you with this ambition – just reach out to @TavernWinter and/or @danielklausen2 for further information). Try one of these pathways into making/composing some elit, and write/reflect on what you learned in your final #NetNarr blog. Keep our #NetNarr backchannel lively! Despite our asynchronous learning plan for the next few weeks, we always have twitter ;). Let’s make sure the backchannel is energetic/dynamic, and that it continues to be a dynamic form of communicating (about elit and other #netnarr topics). Remember to engage in creative moments with -some #dda activity, -blog post sharing, and also sharing -any cool resources you might discover along the way! I will be in and out of our hashtag consistently while traveling to and fro. This week will be officially entitled “Catch Up Week”. This is your chance to catch up on whatever outstanding writing might be left in terms of your overall blog portfolio. It is some extra time to write and reflect on the Netnarr journey. If you do need to circle back to an earlier moment in the course because you missed a post or two, please refer to my weekly posts here on our homepage to get a sense of how the weeks unfolded, and what we covered at what point in time. I will see you for our last day of #NetNarr on Tuesday May 8th. This will be a day to connect, synthesize, and forecast for the final which will be posted on May 18th and due by May 26th. In the meanwhile, enjoy the Spring! (I hope we have more sunny days in April). Ps. Just a final reminder – your midterm exam (which is accessible on the mitt.uib system) is still live/open, and will stay open for you to complete (on your own time) until Friday April 20th. It is an “open book” exam, and reflects what we have covered thus far in the course. Please make sure you complete this midterm exam before April 20th at midnight. From #gaming to #elit this week! After a great week at the University of California-Berkeley thinking about electronic literature within the context of the Digital Humanities (with a group of very inspiring colleagues within the field), I am back Bergen and ready to launch the #elit phase of our #NetNarr experience. What is next? …Electronic Literature! This week will be an important one. 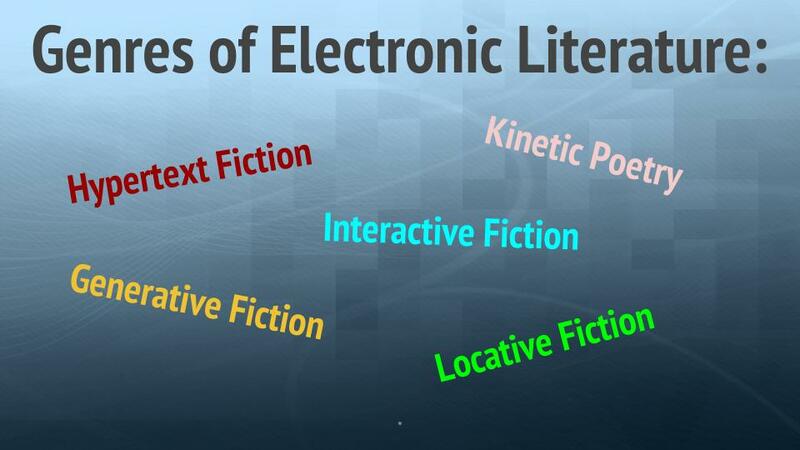 My planned lectures will offer all of you a comprehensive overview of the different sub-genres of electronic literature. I will also introduce the Electronic Literature Collections (Vols. One, Two, & Three). In addition, we will check out other electronic literature resources such as ELMCIP (Electronic Literature as a Model of Creativity and Innovation in Practice). Since I will be traveling for the majority of April (in the UK & Ireland for talks for weeks 16 & 17) I implore you to attend lecture this week (!!) so that we can continue our momentum into the electronic literature phase of #NetNarr. You will have open/asynchronous time next week (while I am away) to explore the ELC collections further. In addition, we will also be participating in a very special #Netprov in this last phase of the course (more information on this to come this coming week). See you all in lecture tomorrow! Ps. Kudos on the emergent #NetNarr activities this past week – which included a field trip to Rain Games, an active pop-up Twine group, and a thinglink hypertext story! Excellent. #netnarr thanks to the people who turned up today. We’ll meet next thursday after the 103 lecture. We've found that having a space free of lecturers lowers the bar of asking simple or seemingly stupid questions. I encourage everyone to join up and download the app as a way to keep up with what your fellow students are up to. What a special few weeks, …time seems to be flying! So much to reflect on, and in the midst of it all, we have this wonderful Easter-week break to share with family and friends. This post will be a bit long since I am bridging the week before Påske with a forecast for the week after Påske. Keep scrolling down for all the necessary information for the end of March and the beginning of April for #NetNarr Norway! Many thanks to all of you for attending my installation opening for Textransformations on March 20th. It was very special to share my work with all of you, and I think we all had a good time at the opening. The amazing installation of @MiaZamoraPhD ! #netnarr Q1 So, I chose Bad News, I found it quite entertaining. But I thought the seriousness of the matter of fake news got a bit lost in the chase for followers. I played Spent. It did a great job at making me feel the despair of being trapped in a system that doesn't want you to succeed. There are so many other thoughtful comments in our #NetNarr stream. It’s worth checking it out. -Just to help keep the tally on your blog posts thus far, your 7th blog should have been posted by now (Påske). If you need to do a little catching up, now is a great time to try! -Your midterm exam (which is accessible on the mitt.uib system) is now live/open, and will stay open for you to complete (on your own time) until Friday April 20th. It is an “open book” exam, and reflects what we have covered thus far in the course. Please make sure you complete this midterm exam before April 20th at midnight. Wow! This week is one Norwegian tradition that I truly love. Hope you are all enjoying it too. On Tuesday April 3rd, I will be flying to Berkeley CA, and I will be there until Sunday April 8th. I am presenting some work at the Center for New Media at UC Berkeley. That means that we will not be meeting for lecture on Tuesday or Thursday the week after this break. Still, there is a great “field trip” for those of you who were able to sign up. Your classmate (and #NetNarr resident game developer) Patrick Solbue will meet all of you who have signed up. Please meet with him directly after Rolf’s Dikult 104 lecture on Tuesday April 3rd, and he will act as guide to Rain Games Studios. Thank you to Patrick for setting this up! 4. 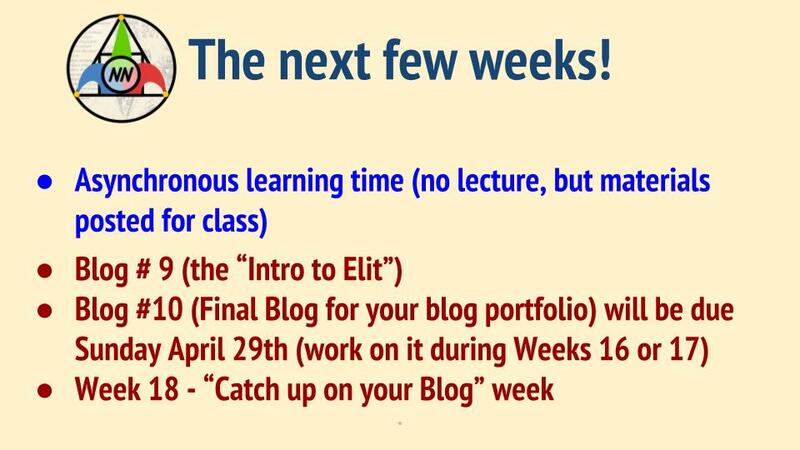 Your blog # 8 should be posted by the close of the first week in April (by Sunday, April 8th). You can write about the field trip or the above Studio Visit, and one or more of the empathy games listed here. I will see you in lecture on Tuesday April 10th. Until then, I will be checking our #NetNarr stream daily and keeping up with your #NetNarr learning there. Please be sure to tweet some pics from Rain Games on Tuesday 3/4!! Another great gaming week in #Netnarr! Ahhhh…So much to cover, so little time. At any rate, I am enjoying our on-going conversation. This week we covered a few different angles on game theory: -game genres, -game aesthetics, -(more) game history, and the video game-as-cultural object. By the close of class on Thursday we seemed to be perfectly aligned next week’s topics including: -games & learning, -serious games, -games & empathy. I am quite sure the Peer Game Showcase is a definite success. I am impressed and I am learning from all of you. Excellent. A special thank you to Thomas (City Skylines), Eirik (WOW) , Denny (One hour, One Life), Elias (Dark Souls), & Rikke (Senua’s Sacrifice) for thought provoking presentations. In all honesty, I wish we had even more time for q & a and follow up discussion. There was so much to consider. Thanks to each of you for opening up a special lens on such a diverse array of video games. I am including my lecture slides from Tuesday (13/3) and Thursday (15/3) here. I hope we can pick up where we left off next week by further considering the game as a cultural object. I plan on incorporating some actual game play in class, so bring your devices! We will do some close reading of our actual game play (keeping in the foreground this notion of the “procedural rhetoric”, as per my lecture on Thursday). -On Tuesday we are having class in the Humanities University Library. There will be a launch event for my art installation entitled Textransformations. I really look forward to sharing this work with all of you. I will meet you all in the library at our regular class time of 14:15. I will presenting a brief description and explanation of my work for the exhibit, and then we can socialize & take a closer look at the installation (you can discover interactive reading “hot spots” (qr codes) and compose some collaborative cut-up poetry. -On Monday March 19th, we have a Studio Visit planned at 21:00 to discuss the topic of gaming & learning. If you would like to join us in this discussion, please send me an email directly as soon as possible, so that I can make sure you receive the link to the hangout. I am sure this will be an interesting chat, and our special guests will be Remi Kalir & Keegan Long-Wheeler. I am sure it will be a very interesting conversation, and I would love it if a couple of you would join us. -On Thursday in class we will continue with our discussion of games (lecture will refer to Understanding Video Games, Chps 7 & 8). We have another peer game showcase, and we will also play empathy games and consider them together during class. -Remember that this week you should be composing your 6th blog post by this coming Sunday (March 18th) which reflects on games, game theory, and game history (as per our conversations this past week). -Also, please remember your midterm exam (which is accessible on the mitt.uib system) will go live on Monday March 19th, and stay open for you to complete (on your own time) until Sunday April 15th. Please make sure you complete this open book exam before April 15th. I will remind you in class about this on Thursday. Looking forward to gathering with all of you on Tuesday at the library!! We are back #NetNarr! …and we are building some momentum now that we have moved on to the game phase of the #NetNarr experience. I have enjoyed getting back into the swing of things this week, and opening up a thoughtful discussion. We kicked off our game unit with an informal poll of what kind of gamers we might be? We have also thought about why it might be an important undertaking to study games, and we have considered who might be studying games, and for what reasons. As Espen Aarseth has claimed, “2001 Can be seen as the Year One of Computer Games Studies as an emerging, viable, international, academic field.” This week we have also looked at the the concept of play (nod to Ian Bogost); everyday game discourse; and we have taken a brief glimpse at the game industry (looking into the value chain of game development, revenue trends, and currents that are shaping game development (from the AAA enterprise to diverse indie game contexts). In addition, we began a consideration of what makes a game?, and we have looked at many theoretical approaches to this question. In addition, we took a look at early video game history. This timeline/infographic is particularly helpful in pin-pointing formative moments in the history of the video game. I am including here the slides from my lectures on March 6th and March 8th here. I am most excited to hear from all of you, and we have launched the Peer Game Showcase that will last for the month of March (up through our Easter Break). Kudos to Patrick (#NetNarr student and game developer) who kicked off our peer presentations with a glimpse into the game developer world. So many thoughtful insights. I especially enjoyed his discussion of ludo-narrative dissonance, which I imagine is a significant challenge when designing a great game in a team context. Patrick has been very kind in arranging a #NetNarr field trip, set for April 3rd. (On that date, I will be in California giving a talk at Berkeley Center for New Media at UC Berkeley). It is wonderful that you will all have the opportunity that day to visit the game development studio Rain Games here in Bergen (with Patrick as host). Rain Games AS is a Norwegian independent video game developer forged from a cooperative community of local artists and programmers. I can’t think of more intriguing field trip to add to our game phase of the course, and my only regret is that I won’t be able to visit with all of you that day. That said, I will make a separate visit for sure. Since there are so many of you in class, not everyone can attend this outing, so by first-come-first-serve basis, please sign up here if you are interested in attending that day during class time that day (3/4). 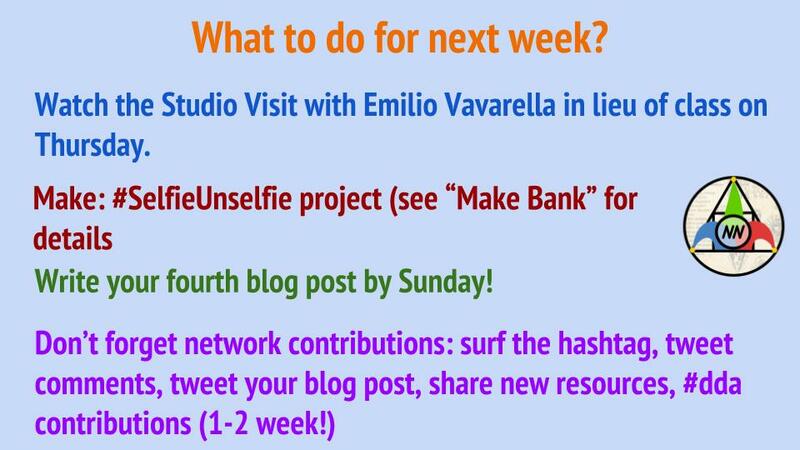 -This week you should be completing your 5th blog by Sunday. As always, your reflection should pick up on some aspect of this week’s material. -For next week, we will be continuing our discussion of game history, and thinking about game aesthetics and culture (covering Understanding Video Games, Chps 5 & 6). -Remember to participate in our active #Netnarr backchannel on twitter. There have been some pretty exciting spin-off activities there and plenty of resources shared. Not too mention…the #ddas that are always clever and fun to check out and share out! We will continue our Peer Game Showcase this coming week, hearing some thoughts on specifics games from Thomas, Daniel, Eirik on Tuesday March 13th, and Elias & Rikke on Thursday March 15th. Really looking forward to this! Oh…and the week after next we have a special #NetNarr date ;)! I hope all of you have been enjoying our respite! It turns out that I caught a pretty bad cold in the midst of this past week, so I have been “on the low down” trying to recuperate, and the timing regarding the break in our class kind of worked out. Still, in my rest-mode, I have enjoyed reading so many #NetNarr contributions (especially the #SelfieUnselfie contributions in some blog posts). How many words is a image? How many words are you? World of Warcraft, League of Legends, Counter Strike, Overwatch, StarCraft, Minecraft, Legend of Zelda, Pokemon, Super Mario Brothers, Skyrim, Undertale, Call of Duty, SIMS, PUBG, Halo, Candy Crush, Destiny, Portal, Assassins Creed, Kirby, (Twitch or Steam…maybe someone can do a showcase on these communities??) This list is not a comprehensive list, of course. **So…, if there is a game you love and really want to showcase that isn’t on this short list, please just email me with your selection. If you are wondering what you might cover in a short/informal “showcase” presentation, you could present how the game works overall, and then present some thoughts on why you play this game. You could share some game-play videos, talk about game mechanics and strategies, and talk about your best game moments, and discuss when you started playing the game and why it caught on with you. Is there a recognizable culture around your chosen game? What kinds of impact has this game had for forming community (or communities)? Dates for possible showcases: March 6, 8, 13, 15, 22. For each of these five days there are at least two slots or two showcase opportunities. I am hoping for at least 10 volunteers. ….And just for added incentive, those who present a game they love in class will get a free pass on the blog post for that week. So I will see you all on Tuesday March 6th to continue with our work together in person. 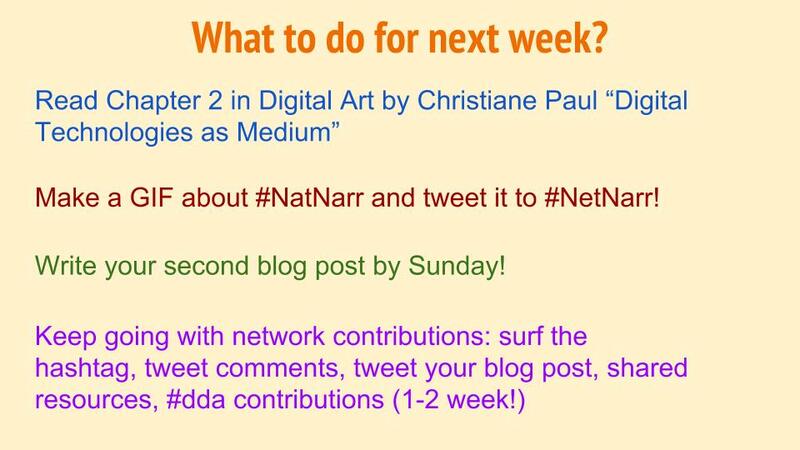 In the meanwhile, check the #NetNarr hashtag here and there (surf a little, contribute some #ddas). …and if you find that you haven’t completed four blogs by now, you might consider catching up during this pause….hint hint. Many of you might be wondering about the take-home midterm which is part of this course. When we return next week, I will speak with all of you about this open book take home exam. You will have a several weeks of time to complete it (on your own time). I will cover all the information on this during classes after break. 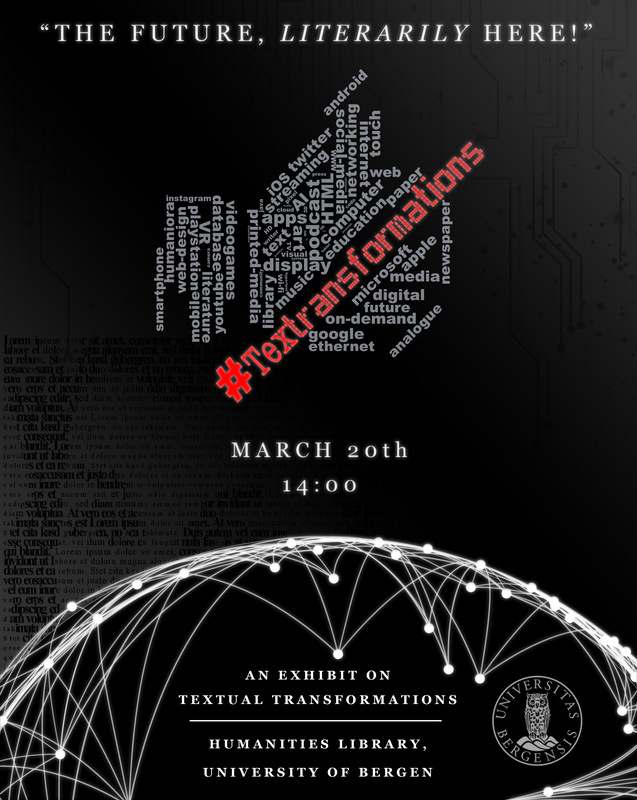 Finally, I wanted to give you all a heads up that on Tuesday, March 20th we will be having #NetNarr class in the University Library, where I will be launching a special art installation called Textransformations. The exhibit explores the shift in textuality from the analogue to the digital age. Textransformations will feature installation sculpture art, found object art, twitterbot poetry, and a locative reading experience. In addition, it will also feature some electronic literature created by my dikult Electronic Literature students from Fall 2017, and it will also feature the #NetNarr course (your public conversation and your creative contributions). Remember to send me an email ASAP if you are interested in taking part in the gaming showcase. Please don’t be shy…the more volunteers, the better for all. I will be planning the March lecture schedule this week, so if you have a specific date that you want to do your showcase on, please let me know right away (first come, first serve). See you in a week or so. Take care of yourselves…. This week we have delved a bit deeper into Net Art. In lecture I spoke about the internet as a distributive, collaborative, multimedia information system. And all internet information is always subject to constant recycling, reproduction, and remix. Of course, this becomes a cultural game changer resulting in a certain reality: the truth is no longer something we can easily apprehend. It seems digital artists were rather prophetic in understanding the implications of this. From the 90’s and after, we have seen a proliferation of net art as well as online galleries, net art curators, and net art critics. Some notable communities of practice include The Thing & Net-Art.org; Rhizome; äda ‘web. I have encouraged you all to explore these sites, and many of you have discovered some engaging projects in Net-Art.org. Be sure to check our twitter stream for some smart peer recommendations. On Tuesday evening we had a truly inspiring #NetNarr Studio Visit with digital artist Emilio Vavarella. 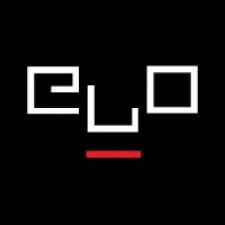 Emilio was able to share his reflections on his creative process, and he walked us through some of the central themes behind his depthful and compelling portfolio of work (i.e. technology & power, mediation & perception). Another theme for this week is further reflection on the issue of self representation in the digital age. The ever present selfie is at once an individual performance, but it is also a communal and public activity. Some claim selfies are a mark of our narcissistic culture. And some see the selfie more positively – as an affirmation of self-love. Still others consider the selfie simply a new version of the old idea of the self-portrait. In addition, it is often argued that the selfie is a key component of a person’s “personal brand”. There is no doubt that selfies have become a particular lens into digital culture in the early 21st century. With #SelfieUnselfie, I have designed an installation to be featured in the Bergen Public Library. Your individual contributions will be curated to form a public art exhibition to be featured for a week in Spring 2018. Next week there is a scheduling conflict due to the Arduino workshops held on Tuesday as well as Thursday. A majority of #NetNarr students are signed up for the Tuesday Arduino course, so I have decided to cancel our lecture. There will be no class meeting on Tuesday 20/2. I will see you all on Thursday morning 22/2 (for those of you who will be attending the Arduino workshop on that day, I am trying to set up a video recording for that lecture). In lieu of our Tuesday time together, I am asking you to check out this recent panel discussion, which was sponsored by Rhizome and takes place at the New Museum in NYC. The panel topic: What is the future for the field of internet art? Will it continue to offer artists the opportunity to connect with publics directly, without relying on art institutions? How will the history of internet art continue to inform its future, given the problems of creating digital social memory? How will the web’s increased competition from locked-down applications change digital cultural production and distribution? What has internet art’s embrace by the mainstream of contemporary art and popular culture done to its form and visibility? Have some fun with the writing and making this week! Until I see you next week…. As most of you already know, there was a mix up in the schedule regarding this week’s Arduino classes and the DIKULT 103 schedule. Please understand that I was informed of this information early last week for the first time. Based on this recent information, I have decided to cancel Week 8 lectures & labs. There are NO LECTURES OR LABS for Dikult 103 #NetNarr for Week 8 (Feb 19th-Feb 23rd). There is no blog due for Week 8. Week 9 is Winter Break (so no blog for break-week either). That said, you are always encouraged to surf and participate in our #NetNarr backchannel twitter stream and share #ddas and/or resources here and there (even if we having a bit of a break from lecture). When we return from break for Week 10, we will pick up our momentum and have some fun as we enter into our next phase of class – gaming! In keeping with this observation, we have looked more closely at how the medium (i.e. the media form used to make meaning) becomes the driving force in the thematic aspirations of much digital art. In particular, we have looked more closely at the concepts of space and time, through the lens of installation and the moving image. We have questioned the relationship between real and virtual space, and how technology both imagines and also transforms our experience of the natural world. We also spoke a bit about about the live webcam (along with databases and interactivity), and how these aspects of digitization have meant radical re-assembly and re-configuration of image sequencing, pushing us to consider the effect of time in new ways. If you want to refer to the lectures this week, here are the slides for February 6th and the slides from February 8th. Welcome to our #NetNarr FLASH Close Reading of digital art! We will consider a couple of contemporary pieces of digital art 2gether live. 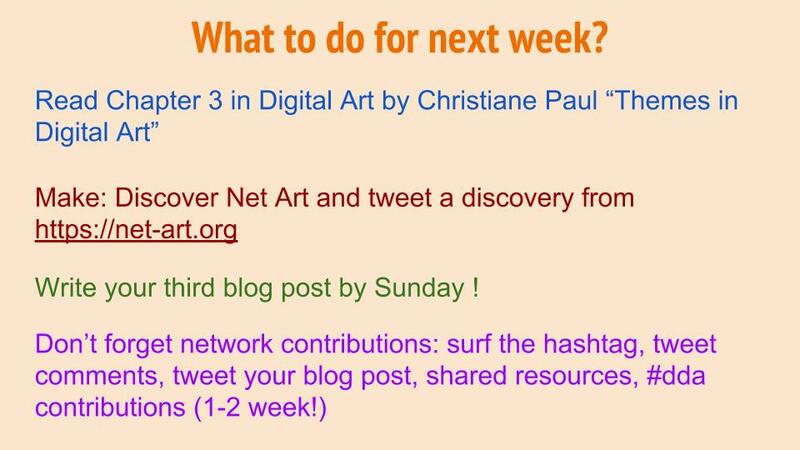 Please respond 2 a few questions @ the art piece w/ the #NetNarr hashtag. The 1st link to #digitalart coming in a minute! We took at closer look at two selected pieces of digital art. With Sky Magic Drone Ballet, we continued to think about the spaces between real and virtual geographies – the gaps and overlaps – and how artists are exploring these worlds. With Eunoia II, we thought about the idea of translation. Park attempts to translate her inner world by manifesting it (through digital technologies) to the external world. Through brainwave technology and sound waves, she makes her emotions appear in new form. This work opened up a conversation about the gap between what is inside vs. what can be apprehended from the outside. We thought about masks that we might wear, and the ways we do (or do not) represent ourselves in the digital realm. This theme will be carried into next week! In lieu of lab time this week, I have asked you all to pursue a bit of research and exploration of Net Art on your own. Please take a moment to explore and familiarize yourself with https://net-art.org. #NetNarr will be exploring https://t.co/7IWuj7q0Vq. We will do a bit of surfing & discovery (research), as we continue our conversation about #digitalart Check out the #NetNarr hashtag for some stand-out #digitalart projects from the site. Just a reminder that I will be in Oslo presenting my Fulbright research and installation projects next Thursday. I will miss you in person on Thursday for sure, but our lecture will be replaced by our Studio Visit video conversation with Emilio Vavarella (the archived conversation will be a required viewing in lieu of our class meeting). I have three excellent #Netnarr students who have signed up to speak with him next Tuesday evening at 19:00. If a few others would like to join that chat, there are still a few spots, so let me know by the close of class on Tuesday. I am really looking forward to this one! Enjoy the Fastelavn weekend. God helg! As I mentioned in class, I am impressed with your creative contributions to our daily digital alchemy (#dda) as well as the meme making burst resulting from lab last week. I am also proud to see some really smart blogging, and I encourage all of you to continue with your thoughtful reflective writing of both the content and context of this course. We had a special lecture on Wednesday from colleague Dr. Leonardo Flores who articulated a thoughtful map for understanding Electronic Literature in generational waves. His talk entitled Third Generation Electronic Literature pointed to participatory culture and easier entry points for production that are also the hallmarks for the overall #NetNarr experience. The implications of Dr. Flores’ observations about this “3rd generation moment” for electronic literature are clearly tied to our collective sense of each other as digital alchemists (producing art, not just consuming art). Regarding that spirit of digital making and composition, this week we will continue making our #NetNarr memes. This time, let’s make some animated GIFs. In lieu of meeting in person for this week, we will make GIFs this Friday & Monday (no meeting in lab, just make your GIF from home). Please be sure to post your GIF to our #NetNarr stream! GIFs have become a kind of calling card of Internet culture. GIFs are often used for bite-sized entertainment and as statements, replies or comments in online conversations. They are also commonly used online to convey reactions, illustrate or explain concepts or products in a fun, creative and succinct way, and also to make GIF art. A GIF is basically an image file format that is animated. The multiple images within a single GIF file are displayed in succession to create an animated clip or a short movie. This single file is encoded as graphics interchange format (better known as GIF). How to make a GIF? It is as easy as 1,2,3. Click here or here to get started. See you on Tuesday. Enjoy the weekend!